New satellite-based technology enables seismologists to peek beneath the surface and paint a picture of what makes the earthquake-clock tick. Roland Burgmann of the University of California at Berkeley published work in the Aug. 18 Science on aseismic creep along the Hayward fault that illustrates a new way to look at crustal movements on a vertical, rather than horizontal, scale. Burgmann’s preliminary findings were incorporated into the October 1999 USGS report that synthesized regional earthquake research and calculated the probability that a major earthquake would occur on each major fault segment and in the overall region. In the USGS report, the Hayward fault estimates are based in part on the idea of a cycle of strain buildup and release, says David Schwartz, chair of the team that wrote the 1999 report. The last major earthquake that originated on the Southern Hayward Fault broke in 1886. 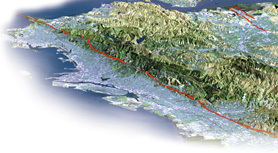 Prior to the 1906 San Francisco earthquake, the 1886, magnitude-6.8 earthquake on the Southern Hayward fault was considered California’s “big one.” An earthquake might have ruptured the Hayward fault in 1836 as well, Schwartz says, but in the early 1990s it was discovered that the earthquake did not originate on the Hayward fault. In his reassessment of the Hayward Fault, Burgmann took advantage of satellite-based radar techniques that are relatively new to the field of seismology. Interferometric synthetic aperture radar (InSAR) techniques have been employed by a few seismologists for only the past five years to measure subtle vertical motions along the faults that result from locked zones at depth, explains Bob Simpson of the USGS, who wrote a comment on Burgmann’s research for Science. Old geodetic and GPS measurements only reveal horizontal movement of points. InSAR can measure vertical warping on the scale of centimeters. To best match surface observations with underground motion, Burgmann estimates that the Northern Hayward fault experiences creep through most of the seismic zone, down to 12 kilometers. There, at the base of the seismic zone, lies the transition between brittle and ductile crust where major earthquakes originate. These findings, Burgmann says, “push down the potential for that segment to produce a very large earthquake on its own.” He also says that the threat of earthquake damage to the region is still very real. His findings show that the likelihood that an earthquake’s epicenter will lie along the Northern Hayward is less because it does not have the locked regions that build up strain. “Locked sections to either side of an unlocked section still provide a lot of energy for slip,” says Jim Lienkaemper, a USGS seismologists who also works in the Hayward fault region. The Southern Hayward and the northern extension of the Hayward, the Rogers Creek fault, contain the locked segments that, when released, could cause the next “big one” to rip through the Northern Hayward as well. area. The image on the top of the page was taken from this same USGS map. “Creep attenuates the hazard from the surface,” Schwartz says. “But regardless of how you cut it, the Hayward Fault is still a really high hazard.” The 1999 USGS report estimates a 32 percent chance that a magnitude-6.7 or higher earthquake will unzip the Southern and Northern Hayward and Rogers Creek fault system within the next 30 years. That estimate is the highest for the faults surveyed in the San Francisco Bay area. Not only can the unlocked segment rupture, the regional shaking caused by the earthquake can cause significant damage miles from the point where the break originated. Simpson cites the 1989 Loma Prieta earthquake as an example. Its epicenter was 60 miles from San Francisco, yet the shaking caused massive damages in the Bay area. 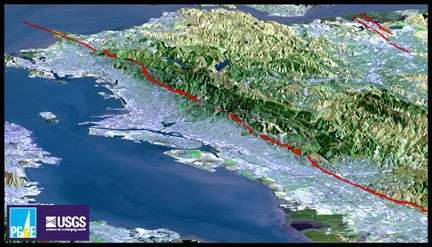 If an earthquake were to break on the Southern Hayward, the release of strain would likely break through the Northern Hayward and into the Rogers Creek fault, causing massive damage to the sprawling metropolitan region. “Don’t unbolt your water heaters or cancel your earthquake insurance,” Simpson says.